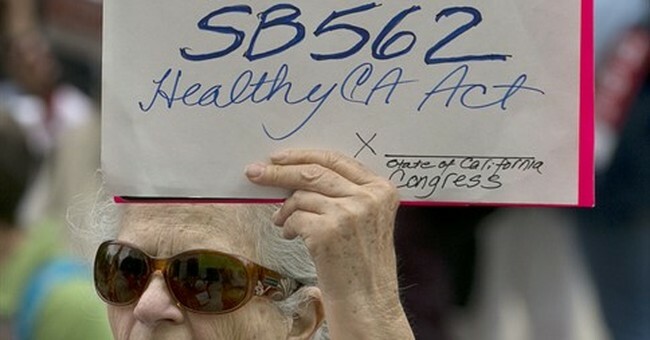 California seems ready to move on a single-payer healthcare system, even though there's still no way for the state to actually afford the cost of the plan. Regardless of this small, insignificant detail, the California Senate passed Senate Bill 562 with a vote of 23-14. The bill now moves on to the Assembly. There, the bill will likely (hopefully?) be amended to include some sort of tax to actually pay for it. The amendment process, however, could kill the bill entirely. This being said, some senators are still quite proud of themselves for advancing the concept. Senate Bill 562, by Sens. Ricardo Lara, D-Bell Gardens, and Toni Atkins, D-San Diego, passed 23-14 and will now advance to the Assembly, where it will likely be amended to include taxes. And that would mean the measure would require two-thirds votes in both chambers. “What we did today was really approve the concept of a single-payer system in California,” Lara said in an interview after the vote. About two weeks ago, a cost analysis estimated that a single-payer system in the state would cost more than the state's entire current budget. An increased payroll tax has been suggested as a possible revenue source. Cost has been a significant hindrance in other states' efforts to implement a single-payer system. Vermont passed "Green Mountain Care," but was forced to abandon the law before it could be implemented as the single-payer system would bankrupt the state.